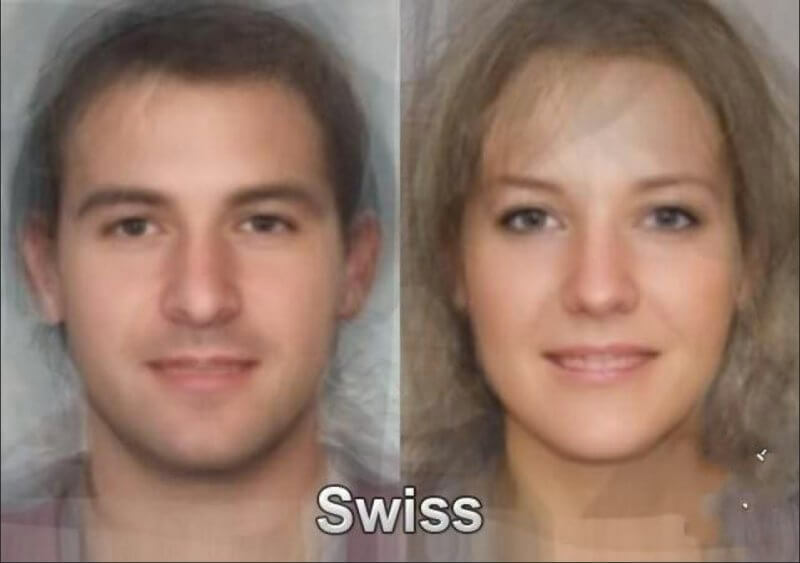 According to our romantic beliefs, the average Swiss is either a Heidi or a Peter type. Statistics paint a slightly different picture, however, so we would like you to join us for a though experiment. Firstly, how do most of us imagine a stereotypical, über Swiss couple? 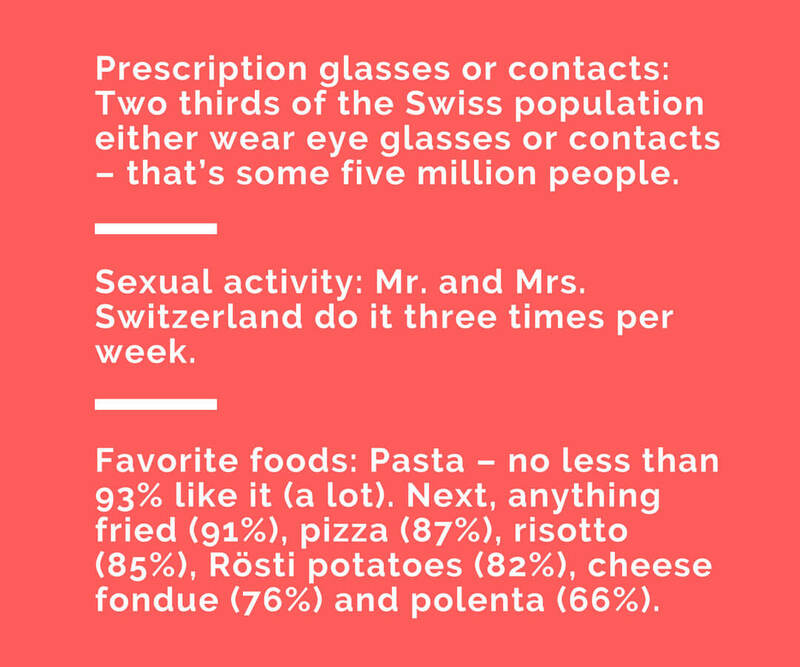 Once we have met Mr. and Mr. Helvetia, we will dig up some statistics to tell you what the average Swiss is really like. Obviously, Mr. Helvetia is bearded and always wears a traditional Sennenkäppi hat. She wears her blond hair in braids and will only leave the house while wearing her Edelweiss embroidered folk costume. Mrs. Helvetia owns a Freitag messenger bag. And it goes without saying that each Swiss, men and women alike, owns their own dairy cow for in-house chocolate production. And finally, Mr. and Mrs. Helvetia are wealthy – pardon: well situated. But they prefer not to talk about money matters. 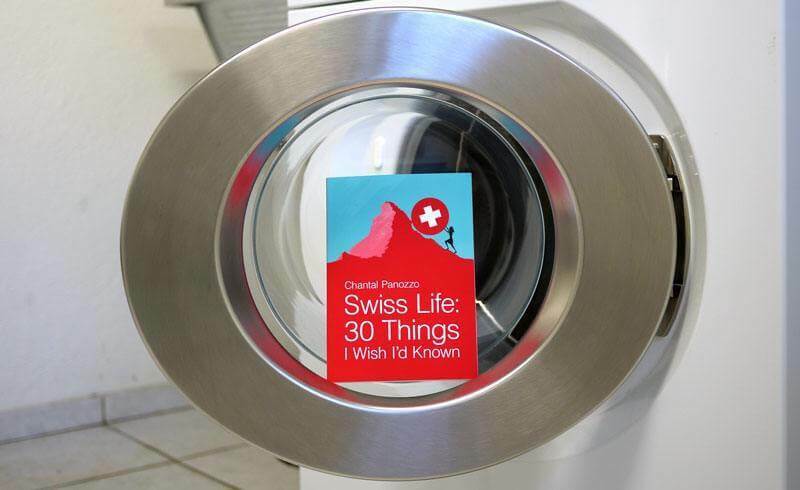 Now, let's shelf the Swiss stereotypes and clichés, and let's get real. In reality, it is your hipster Swiss with his black rim glasses. It's the mom in T-shirt and jeans. It's the contractor wearing a safety uniform and a businesswoman in a tailored pant suit. They are blonds and brunettes, some with a lighter or tanner complexion. Some of these Swiss are tall, others are short. Some are big and others are slim. 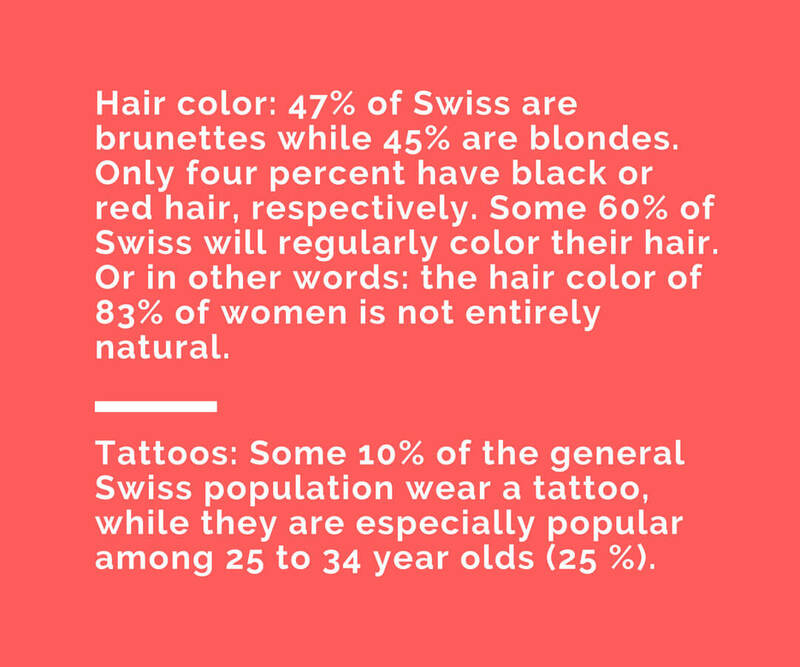 Given that the Swiss are as unique as can be, we wanted to research interesting statistics about the lives of the Swiss. How many hours does Mr. Helvetia work every week, and what are his hobbies? 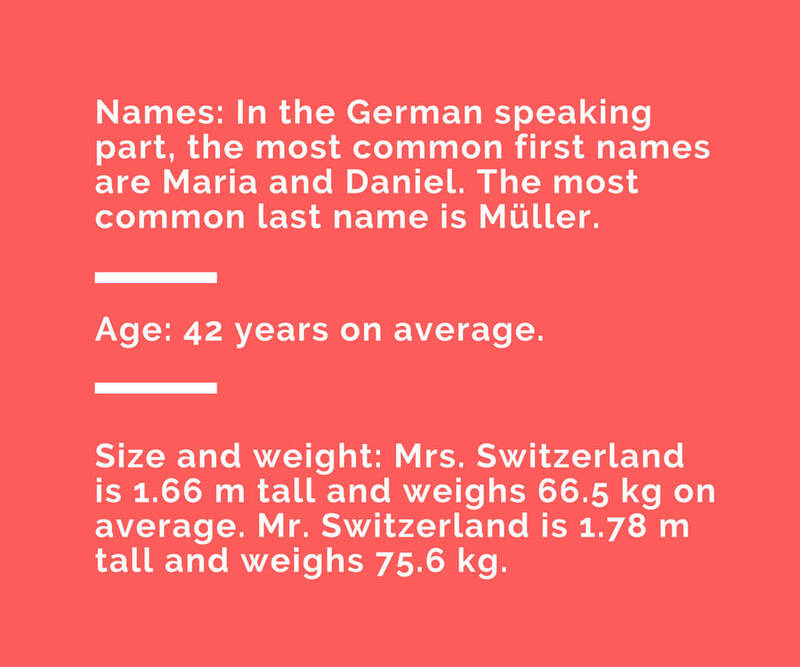 How big is an average Swiss family, and where does Mrs. Helvetia go on vacation? Internet: 85 percent of Swiss go online at least once per week, and 91 percent of households have access to the Internet. Television: The Swiss spend an average of 124 minutes per day watching TV. The program with the highest market share at 50 percent? It's "Meteo", the Swiss weather forecast. Mobile phones: There are 11.4 million active mobile subscriptions in Switzerland. Thus, the average Swiss owns 1.3 mobile phones. Newspapers: The Coopzeitung weekly is distributed to 2.5 million households and has a readership of 3.5 million, making it the most read newspaper in Switzerland. Workforce size: In Switzerland, some 4.97 million people are employed, whereas three percent work in agriculture, 21 percent in industry/trade and 75 percent in the service sector. Apprenticeships: The most popular job profile is business management (Kaufmann/Kauffrau). Unemployment: The current unemployment rate is three percent, meaning that 197’000 people are in the job market. Entrepreneurship: 15 percent of employees are self-employed. Commuting distance: Some 3.9 million people commute to work, with the average commute being 14.5 km. Every fifth commuter crosses into another canton, while every other commuter works in another commune (51 percent). The remaining 30 percent work in the same commune where they live. Transportation: 52 percent of commuters use the car, 17 percent commute by train, 13 percent with public transportation in general, nine percent walk to work, seven percent use the bicycle and two percent a motor bike. Favorite leisure activity: Hiking is number one, and the average Swiss will be out there for 60 hours per year. Second in line is going for picnics or generally going on short trips. Favorite hobby: Among creative hobbies, photography is king at 21.7 percent. Painting and sculpture come in at 21.4 percent while 18.9 percent like singing. Vacation destinations: Switzerland (34 percent), Germany (13 percent), Italy (12 percent) and France (10 percent). Only seven percent will travel abroad. Trip distance: Those who do travel abroad will fly an average distance of 9000 km. Household budget: Of their monthly budget, the Swiss will spend 10 percent for food, three percent for alcohol and tobacco products as well as four percent for clothing. The largest expense by far is rent at 25 percent. Health expenses amount to 15 percent, transportation to 11 percent and hotels/restaurants to nine percent. Monthly culture expenses: The average household spends 49 francs for printed media, 19 francs for internet access, 18 francs for theater and concert tickets, 13 francs for music and dance classes and five francs for museum admissions. 5. 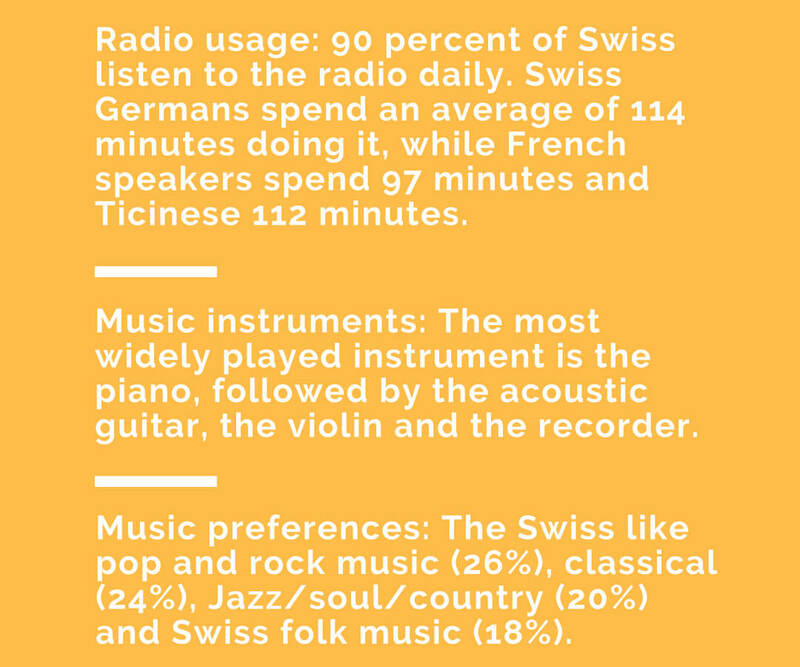 What about the preference for radio and music among the Swiss? Now, was this profile spot on? Or totally off? Please let us know in the comments. This article is inspired by an editorial from Noëmi Kern, Markus Kohler, Andreas Eugster and Sophie Hollenstein. It has originally appeared on July 31, 2017, in German in the Coopzeitung, and we have freely translated it with the authors' permission. Breaking News: Obama has Swiss Roots! I Spy Something Beginning with "S"
7 examples of modern Swiss architecture How well do you know Switzerland? Take our new Swiss quiz!